You might have to go to Beaches Resort to get it! If your family is like our family, the concept of a relaxing family vacation is an oxymoron. Either you are running around keeping the kids entertained, or the kids get bored really fast and start complaining. Either way, you come back from the week off wishing you had a another week off to recover from the previous week. Last year, I had the opportunity to go to the Beaches Resort myself – on the Turks and Caicos island. It was for a blogger conference and it was only for two days. So I didn’t bring the kids or even my hubby. I went down to get a sense of the hype, to be honest, and to see if a vacation there would be right for my family…and as relaxing as they say. Fast forward to now – we are going again and our whole family is going. I am so excited for this vacation. It is our first trip with the kids other than Florida or New York. I’m excited for the relaxation, I’m excited for the family time and reconnecting as a family. 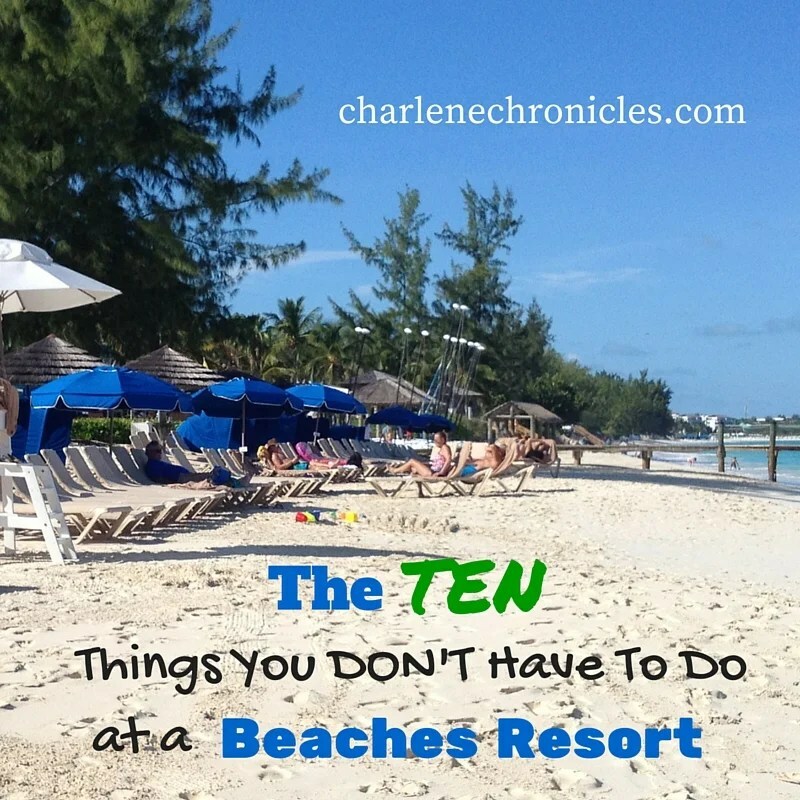 Here’s is why with my: ten things you don’t have to do when on a Beaches Resort vacation! 1. No need for car rentals. When you arrive at your destination, you receive included transportation to your resort. 2. No need for car seats. If you need a car seat in the transportation to and from the resort, just request a car seat prior to your arrival! 3. No need for strollers. If you need a stroller during your stay, you can rent one for as little as $10 a day. If you have an infant, you may want to bring your own. 4. Don’t need to plan your dining reservations. With over 19 restaurants at the Turks and Caicos Beaches resort, you can wing it. Pick where you go and what you want on a whim! Don’t have to pick times to dine, or decide where you want to go days or weeks in advance. 5. Don’t have to pick the beach over the pool. The Beaches Resort has lots of swimming pools and a beach at your doorstep. Go from the beach to the pool and back! No need to chose where to spend the day. 6. Don’t have to shop. No need to go grocery shopping for snacks and drinks. Everything is included. If the kids get hungry or thirsty, just go to one of the many swim up bars or drink pavilions. Or grab a snack at many of the restaurants – some of quick serve so grab a slice or pizza or ice cream! 7. Don’t have to find a babysitter. Forget having to hunt down questionable babysitters or bringing a Nanny from home so you can have a date night with your partner. There are caregivers on site at Beaches and a daily kids camp from 9am-9pm at most resorts! The daily camp for kids 0 and up is included so no need to juggle! No signup needed, and use it for an hour, the whole day, everyday or mix it up with an hour in the morning and three hours in the afternoon! 8. Don’t have to stay in one place. If you want some adventure, there are lots of excursions from local treasure hunting, snorkeling or boat adventures. Yet, doing nothing has its merits too! 9. Don’t have to spend time checking in. You can check in online before your trip so all you have to do is show up and start vacationing. 10. Don’t have to limit the amount of family coming. There are lots of room options, including combined rooms, combined rooms with a common area, suites and villas. Plus, there are group discounts for multiple rooms. So bring uncles, aunts, grandparents and cousins for a big, relaxing, family vacation! Read more about my Beaches Resort experiences and reviews here!